David Lee Gallagher, of both Irish and Cuban heritage, was born on February 9, 1985 in Queens, New York. His mother, Elena Gallagher, helped start his career in the industry by answering an ad in the local newspaper for a Hasbro toys commercial. This ended up being David's first print job at the mere age of 18 months. For the next few years, David appeared in around twelve different advertisements for companies such as Tyson Foods, First Eastern Bank, Wonder Bread, Bounty, Panasonic and Betty Crocker. It was these commercials that helped David win the 1993 role of Mikey in the major motion picture, "Look Who's Talking Now", starring John Travolta and Kirstie Alley. Bitten by the acting bug, his talents then led him to appear in the musical, "A Christmas Carol", at New York's City's Paramount Theater. It did not take long for David to amass a credit list spanning both television and film. Quickly growing in popularity, he received roles in television movies such as, "It Was Him or Us", "Summer of Fear", and "Bermuda Triangle". In 1996, he teamed up with John Travolta again, this time playing the role of Al in "Phenomenon", alongside Kyra Sedgwick. Not long after, David landed his most famous role to date - that of Simon Camden in the immensely successful family series, "7th Heaven". Because the show was filmed in California, David, his mother, his step-father Vincent Casey, and his brothers and sisters made the move to Los Angeles. In 1998, he won his first award for his role as Simon, a "Young Star Award" entitled "Best Performance by a Young Actor for a Television Drama Series". For 10 years, David grew up before our eyes on the small screen, earning himself a dedicated fan base and teen idol status. 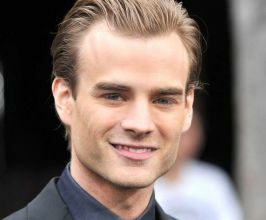 During breaks from working on "7th Heaven", David spent time acting in made-for-tv movies and in several theatrical releases. These included, "Angels In The Endzone", "Richie Rich's Christmas Wish", "The New Adventures of Spin and Marty", "Little Secrets", and "The Quiet". He also lent his voice to several different projects, including the television shows, "The Wild Thornberry's", "Rocket Power", and the popular Square/Disney video games, "Kingdom Hearts", and "Kingdom Hearts 2". After graduating from Chaminade High School and winning, "Choice TV Male Drama Actor" at "The Teen Choice Awards" in 2003, he went on to study at the University of Southern California's School of Cinema-Television, with a major in Cinema Critical Studies. He took some time off from the 8th season of "7th Heaven", but in his sophomore year managed to fit the show into his schedule and finished out the series until its finale on The WB network in 2006. This didn't mark the end of his career in television, however. Not long after the end of "7th Heaven", David guest starred in the hit CBS series "Numb3rs". His performance as serial murderer Buck Winters truly revealed David's talent as an emerging adult actor. In December of 2002, he finished a short film called "Ten Bucks", which he wrote, directed, produced and starred in. This was the first of many projects to come in which David did more than act in front of the camera. Expressing an interest in the production side of film since he was a child, David put this into practice with the release of "The Picture of Dorian Gray". Not only does he play the lead role of Dorian, but he also helped produce the indie film which premiered early 2007. As the oldest of four siblings, David acts as a big brother and role model to his brothers, Kyle and Killian, and sisters, Michelle and Kelly. He likes to spend time clubbing, playing his guitar, and playing video games. One of his passions is cars, his collection including a 1964 Chevrolet Impala, a 1971 Oldsmobile 442, a 1973 Ford Mustang convertible, and a 1967 Pontiac Firebird. He also has a red Dodge Viper and a Plymouth Prowler. Over the years, David has contributed to many charity organizations, such as Famous Fone Friends, Camp Ronald McDonald, Sierra's Light Foundation, PETA - People for the Ethical Treatment of Animals, and has been a youth ambassador for CAN - Cure Autism Now. David was motivated to support CAN because of his brother, Killian, who suffers from the condition. Graduating from USC in the Spring of 2007, David now has a lot more time to devote to projects and to focus on his lifelong goal of becoming a successful director, producer and writer of film. Currently, his latest project is a role in the horror movie sequel, "Boogeyman 2". He is also credited to star in an independent feature called "All-Nighter" later this year. With his talent and drive for success, I think we can safely say that Hollywood has definitely not heard the last from David Lee Gallagher. All American Speakers is a speakers bureau and booking agency providing information on booking David Gallagher for speaking engagements, personal appearances and corporate events. Contact an All American Speakers Bureau booking agent for more information on David Gallagher speaking fees, availability, speech topics and cost to hire for your next event. Please Note: All American Speakers Bureau acts only as an entertainment broker/producer for corporate functions, private engagements and special events. All American Speakers Bureau does not claim or represent itself as the exclusive agent or management of David Gallagher or any artist on this website. Speaker fees are determined based on a number of factors and may change without notice. Fees often vary based on a number of factors including: speakers schedule, supply and demand, length of presentation, location of event and other factors. Fee Ranges listed on this website are intended to serve only as a guideline. In some cases, the actual price quote may be above or below the stated range.